During times of war, governments are notorious for capitalizing on their ability to suppress dissent and manipulate the masses. In the wake of 9/11 hysteria, the Bush administration enacted several controversial pieces of legislation that severely curtailed Americans’ freedoms under the pretext of “security” and “protection”. With the help of a consistently compliant and unquestioning media, his administration also instituted a legal framework to circumvent citizens’ civil liberties and target their free speech. Bush’s cabinet adopted Orwellian rhetoric and Nazi style propaganda to litigate sweeping measures that further eradicated liberty: The Uniting and Strengthening America by Providing Appropriate Tools Required to Intercept and Obstruct Terrorism Act’s (USA Patriot Act) warrantless domestic wiretapping, and the Homegrown Terrorism Act & Animal Enterprise Terrorism Act’s criminalization of thought and peaceful activism. Nine years after 9/11 and two years into Obama’s reign, the vague threat of terrorism still hangs in perpetual balance as the justifying cliché for the administration’s continuation of such Bush-era policies. Obama has followed the same Bush trends of illegal detention, rendition, wiretapping, spying, state secrets, demonization, persecution and fear mongering against the population. Obama has aggressively cracked down on whistleblowers exposing military corruption as well as given a green light to assassinate US citizens abroad without due process of law. One of the most disturbing trends in the ever-expanding police state are the new Z Backscatter vans, vehicles that are giant X ray machines, designed to discreetly scan through people’s houses and cars without their knowledge – a surveillance tool that blatantly violates fourth amendment rights. Like Orwell’s portrayal, the US government’s expanding power structure relies on nationalist propaganda to manufacture and cultivate the fear of an enemy. Although the War on Terrorism has consumed the political climate for almost a decade, the chances of actually dying in a terrorist attack in the United States are statistically insignificant. This little mentioned fact undermines the current administration’s justification for their extension of state powers and secrecy in order to protect the country’s “national security”. It’s critically important to create dialogue about America’s covert slide to fascism. 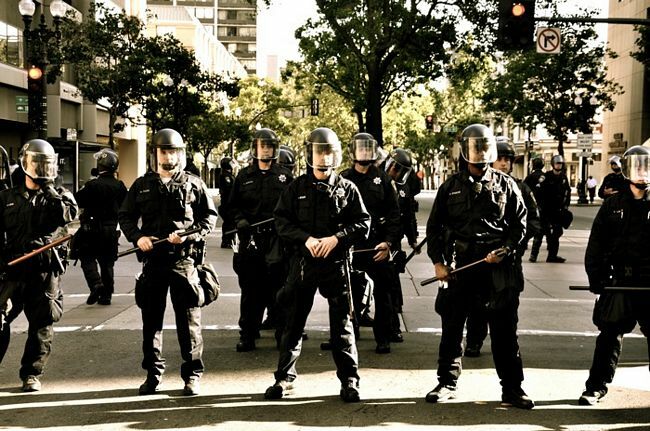 Absolute power corrupts absolutely– our politicians and their corporate puppeteers will continue their greedy power grabs unabated unless our society starts speaking out against the dehumanization and the unconstitutionality of the emerging police state. Do We Know the Truth about 9/11? Fascinating! It was integral, I think, to the message of 1984 that the fascist situation developed over time. The willingness of a nation to largely accept what was being done to their lives by a fascist government sprung from unwitting emotions. I love that you cited that old axiom:’the cleverest thing the devil ever did was to convince you he didn’t exist’, and remember, a country is it’s own beast. In this interview, at 30 min. they bring-up the Spanish-American war, and it’s domestic roots of cause. Bacevich asks the question: ‘does the explanation for our foreign policy lie outside our borders or within our borders?’. It seems like an interesting path to understanding why Bush was advised that a war-time president always gets re-elected, influencing his decision to go to war some claim(PBS doc Bush’s war or maybe something about Karl Rove, cant recall). This interview, which i of course recommend, also helps to perhaps see even more clearly the integration of domestic security and the war(on terrorism). I think it is the perfect storm that will push america into total fascism. It is good to be aware and to share information so that we may all hold the front. Our city is actually just surrounded by huge trenches; that’s no hill. Great article. Unfortunately, the ignorant masses in this country won’t feel the tightening noose around their necks until it’s too late. Assuming it’s not already. Good article, but I can think of another explanation of what has been going on. It does not seem to me that all these developments are according to some strategic plan of conditioning America. Rather, it looks like Federal Government has become the largest corporation, and is functioning according to all the usual market laws, creating the demand and offering the product, by all means possible. Hence blackscatter machines, and everything else. And further, this trend coincides with the trend of US companies of the recent decades to rely increasingly on the marketing efforts than on the product itself, so that lies, distortions, misleading and deceptions become morally acceptable in the society, as long as they are not “illegal”. If corporation “Verizon” can lie from its webpage that it has award-winning customer service even though no awards were ever awarded, then in about the same fashion the corporation “US Government” can lie that Iraq war was to protect us all from WMD. But then this particular corporation “US Government” is in unique position because it is pretty much in position to define what is legal. This all started nearly a decade ago under a false flag attack. Well written, you have an art of speech. You should write a synopsis of all illegal technology used that should be eliminated, include the Raposcan machine!